Garmin nüvi 660 or Garmin nuvi 660 is a GPS navigator from Garmin Personal Travel Assistant product line, which is suitable to be a pocket vehicle GPS Navigator too. 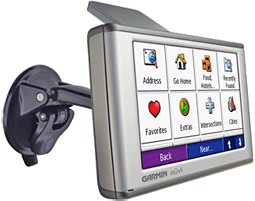 Garmin nuvi 660 features integrated Bluetooth wireless technology with a microphone and speaker that lets users connect to handset and make hands-free mobile phone calls. Garmin nuvi 660 comes with preloaded City Navigator NT North America or Europe full coverage maps that include automatic routing, 3D or 2D map perspective and turn-by-turn voice directions with street names speaking. Other features include configurable vehicle icons, super-bright 4.3″ WQVGA wides-touchscreen display, integrated FM TMC traffic receiver, wireless FM transmitter, MP3 player, audio book player, JPEG picture viewer, currency converters, and other conveniences for travel needs. PC Magazine reviews Garmin nüvi 660 and concludes with very good editor rating of 4.5 out of 5 that road tests of the nüvi 660 yielded no surprises. Like all Garmin products, the nüvi 660 is based on Navteq mapping data. The test routes generated on it were identical to those from other Garmin products and very accurate. The device’s vehicle-routing profiles include Car/Motorcycle, Pedestrian, Bicycle, Truck, Bus, Emergency, and Taxi. Voice prompts were given at appropriate intervals. Garmin’s text-to-speech converter announced street names accurately. One disappointment, though, is that the 660 doesn’t support multisegment routing. Garmin’s nüvi 660 is now the leader of the high-end shirt-pocket GPS market. It’s pricey, but if you want the most fully featured yet tiny navigation device with a 4.3-inch screen, the nüvi 660 is your only choice.